The Newberry Library, founded in 1887, is an independent research library that is self-governing and free and open to the public. The Newberry serves thousands of public readers and program participants each year, and also sponsors one of the largest fellowship programs in American research libraries. Cartography, printing history and book arts, renaissance studies, Native American studies, history of religion and music, genealogy and local history, Chicago and the Midwest. Further details about some of these collections are given below. 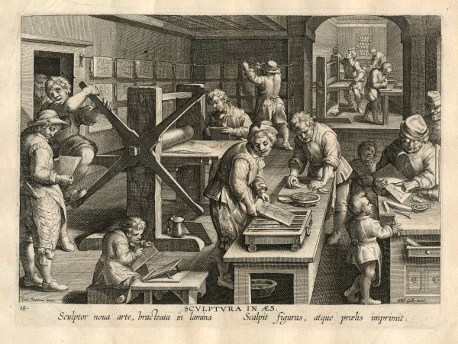 John M. Wing Foundation on the History of Printing The Newberry’s collection on the history of printing and the book arts is one of the world’s leading collections in the field. Collection strengths include the design of letter forms, calligraphy, type and type-founding, technical innovations in printing, design usage and theory, bookselling, bookbinding, papermaking, the history of book collecting, and the history of libraries. The Newberry began to collect in earnest on the history of printing and allied fields of the book arts in the years just after World War One, under terms of a bequest by Chicago journalist and publisher John Mansir Wing (1844-1917), who envisioned “a great typographical library.” Today, the John M. Wing Foundation on the History of Printing includes nearly 100,000 volumes of technical literature, periodicals, and historical accounts of printing and book arts; over 600 cubic feet of printing and publishing-related archives (in 56 different collections); 650 calligraphic manuscripts and 2,100 printed volumes on calligraphy; 68,000 volumes of classified printing samples of every period (including 2,200 from the fifteenth century); and over 15,000 items of printed ephemera. Maps, Travel, and Exploration The Newberry houses more than 600,000 maps and a large collection of related sources pertaining to the history and culture of travel. The geographical coverage is best for the Americas and Western Europe, but all regions of the world are well represented. These materials include maps, published texts, manuscripts, art and photography, and ephemera. The holdings for travel history and culture are also strongest for Europe and the Americas, from the sixteenth through the mid-twentieth century. American Indian and Indigenous Studies As a collection of general Americana, the Newberry’s Edward E. Ayer Collection is one of the best in the country and one of the strongest collections on American Indians in the world. In 1911, Edward E. Ayer (1841-1927) donated more than 17,000 pieces on the early contacts between American Indians and Europeans. Ayer, a member of the first Board of Trustees, was the first donor of a great collection to the Newberry. Since then, the Ayer endowment fund has enabled the library to collect in excess of 130,000 volumes, over 1 million manuscript pages, 2,000 maps, 500 atlases, 11,000 photographs, and 3,500 drawings and paintings on the subject. American History and Culture Every period of American history—from New World encounters to the Civil War to the Chicago literary renaissance and beyond—is well represented in the Newberry’s collections. Over many decades of collection development, the Newberry has built up an extensive array of archival materials, monographs, periodicals, ephemera, and rare, idiosyncratic works. For materials from the mid-eighteenth through the twentieth centuries, see Modern Manuscript Abstracts. Medieval, Renaissance, and Early Modern Studies The Newberry collection is rich in European printed and manuscript sources from 1300 to 1800. Italy, France, and England are best represented, but the holdings are also strong for Spain, Portugal, Germany, the Low Countries, and the Americas.